Quick guide to using CiaoPP. In this tutorial we assume that CiaoPP has been installed (see Installation for more information). 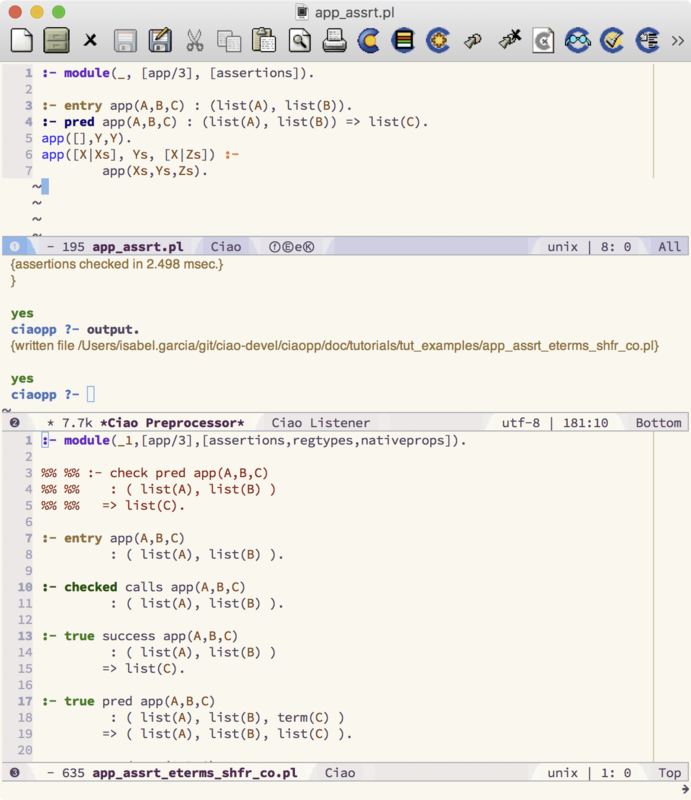 For more information see the Advanced Tutorial on Program Development and Optimization using the Ciao Preprocessor. In this tutorial we want to quickly illustrate the kind of static processing that CiaoPP can perform. :- entry app(A,B,C) : (list(A), list(B)). 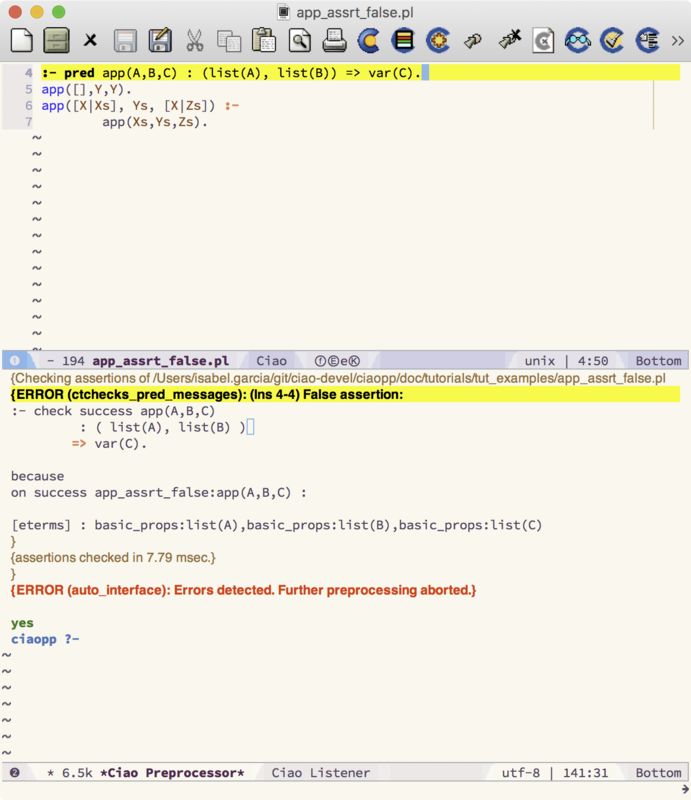 Automatic analysis can be performed by using the direct acces button in the emacs interface . The inferred information is expressed with (true) assertions (for a more extensive tutorial of the assertion language see Using assertions for preprocessing programs). => ( list(A), list(B), list(C) ). Assertion (1) contains types information and encodes predicate app/3 is called with A and B as lists and if it succeeds, C will be a list. Assertion (2) contains information about how variables are shared. It was inferred that when app(A,B,C) is called arguments A, B, and C may be shared and if it succeeds they also will be shared, sice C is the concatenation of A and B. Let us add an assertion with properties that we want to prove about the execution of the program. 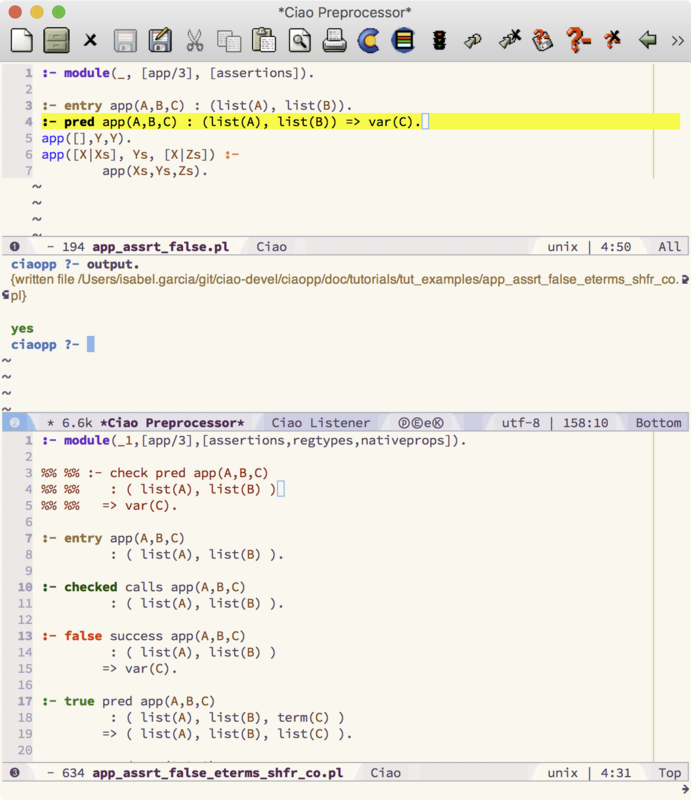 :- pred app(A,B,C) : (list(A), list(B)) => var(C). Of course this assertion does not hold and we get a message saying so. :- pred app(A,B,C) : (list(A), list(B)) => list(C). 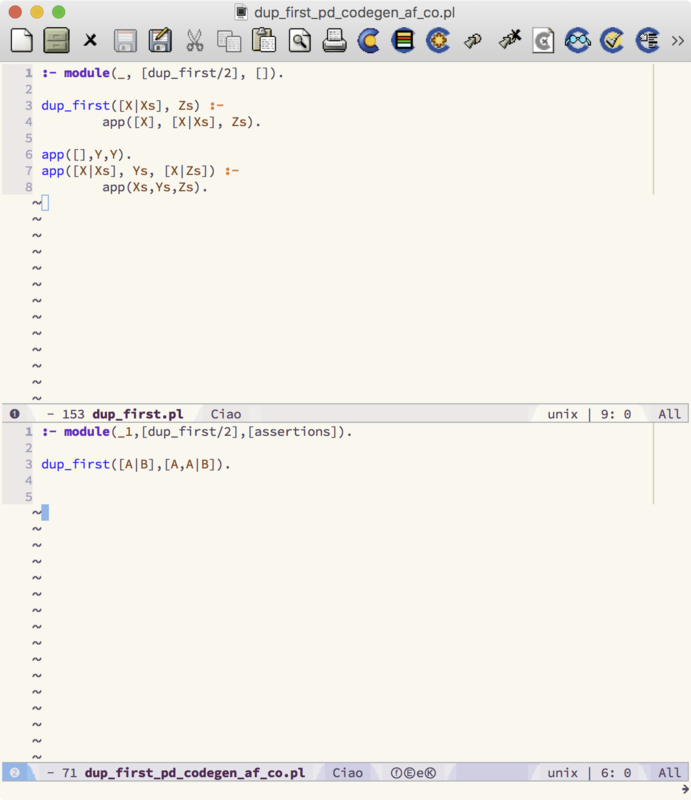 The following program naively implements a predicate that duplicates the first element of a list. CiaoPP has several parameters for each of the main actions. 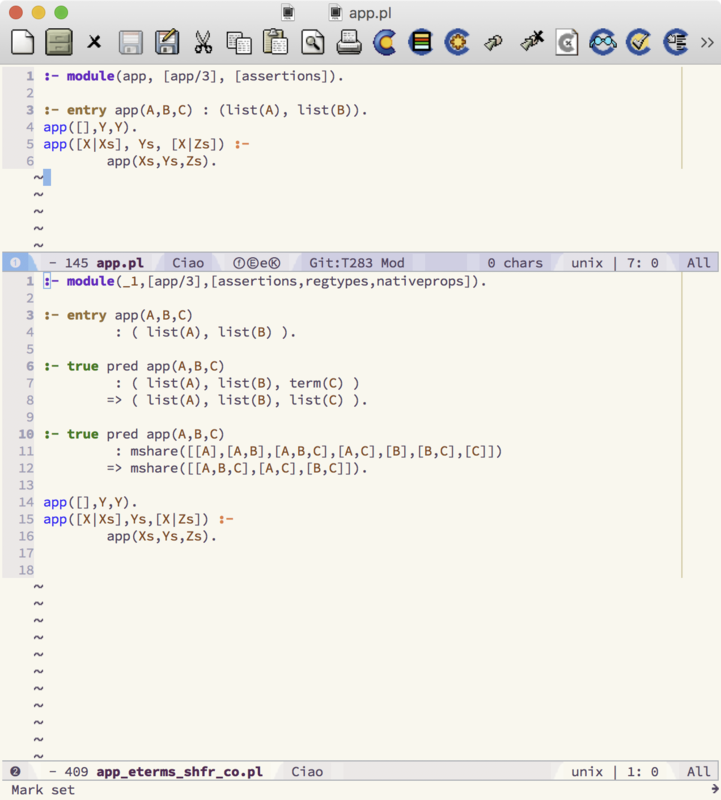 For more information, see the Advanced Tutorial on Program Development and Optimization using the Ciao Preprocessor.